I didn't do it, my arm did. Naughty, naughty arm ! Hey, you in the audience, come here to fight ! "Think you have what it takes to get into World Wrestling Entertainment? Think again. Welcome to the 'minor leagues' of sports entertainment, where every rookie jobber in the industry learns the school of hard knocks. Build your favorite Superstar from the ground-up and graduate to the world of WWE programming. From there you will begin your ultimate quest for the elusive WWE Championship Belt. But don't get too comfortable once you've made it, you will need to do more than watch your back to go all the way in this business. In WWE Day of Reckoning for the Nintendo GameCube, hit the ropes against 40 of the WWE's top Superstars in an all-new story mode where a rookie's dream becomes a Superstar's reality." - Enhanced Grappling Engine: The complete balance of strategy and speed featuring strong and weak grapples with an all-new submission system as well as realistic reversals and Superstar finishers! - New Superstar Momentum Shift: Turn the tables on your opponent when they least expect it with a Superstar specific momentum shift! - Create-A-Superstar: Choose between a variety of settings including appearance, entrance movie, costume and moves"
This game is very good and the graphics are very nice, I like this game. This is going to be released around September 2004. I can't wait to see what this game's improvements are and I'm looking forward to more match types and that turning the tables move. 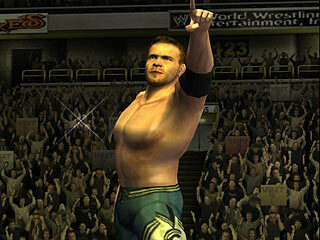 WWE Wrestlemania 19 was ok but its revenge mode didn't have the feeling of a story mode and was too short. They gotta nice create a character though. WM XIX failed to give more of a variety of match types and backstages. Hopefully this game will be mad good. I'm gonna reserve it next month or something. Word.